May 16th was PIBO’s busiest day this season, with 95 birds banded of 20 species. The banding totals showed a definite influx of Chestnut-Sided Warblers (18 banded) and Northern Parulas (7 banded, which is equal to PIBO’s previous highest total of Northern Parulas banded in an entire year). Since then, though, the number of birds banded has steadily declined as we approach the end of the spring migration. An Eastern Kingbird was banded on May 19th, an unusual capture as this flycatcher species prefers open spaces and usually stays up above the dogwoods in the netting area, out of reach of the mist nets. This was only the second kingbird ever banded at PIBO. A warm front moved through on May 21st, heralded by a short-lived but torrential thunderstorm that drenched PIBO’s field workers. Nets were opened for only half an hour before being closed due to rain with no birds banded, but a large snapping turtle was seen wallowing about in the muddy net lanes. It seemed to be enjoying the rain a lot more than the field workers were. The first Mourning Warbler of the season was banded on May 22nd. These warblers are one of the last migrants to move through the island in the spring, and herald the end of the migration season. While on census, Sumiko took pictures of some warblers hopping in and out of the bushes along the edge of the beach and afterwards, while viewing the photos, realized one of them had been a Connecticut Warbler, the only one observed this season. A Blackburnian Warbler, two Wilson’s Warblers, two Canada Warblers, five American Redstarts and two Ovenbirds were all banded on the 25th, but since then warbler diversity has been steadily declining. Two Northern Waterthrushes were also banded, unusually late. Magnolia Warblers were captured on the 29th, 30th and 31st. 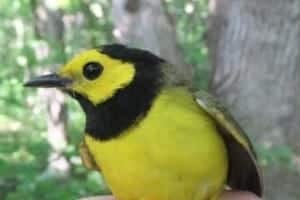 A male Hooded Warbler (seen above) was banded on May 31st – a very attractive bird, even though it turned out to be infested with bird lice (which tickle, but are not harmful to birds that are in good health). Small numbers of warblers are still being sighted on census (mostly Ovenbirds and American Redstarts), but in general, the spring migration is mostly over. June 1st was the final day of banding for the spring season. Five birds were banded of five species, all of them local nesters: Yellow Warbler, Grey Catbird, Downy Woodpecker, Common Grackle and Red-Winged Blackbird. The Downy Woodpecker expressed his dissatisfaction with being banded over the front of the bander’s last clean shirt, ending spring banding with a flourish. Census will continue for a few days longer, and then PIBO will move on to conducting breeding bird and marsh bird surveys. Migration monitoring will resume in August.